Dementia (also known in a slightly altered version as Daughter of Horror) is an American film by John Parker, incorporating elements of the horror film, film noir and expressionist film. A young woman awakens from a nightmare in a run down hotel. She leaves the lodging and wanders into the night. She encounters a dwarf hawking newspapers with the bold headline “Mysterious stabbing.” She smiles enigmatically and quickly walks on. In a dark alley, a wino approaches and grabs her. A policeman rescues her and beats up the drunken man as she leaves. Along her way, a pimp, sharply dressed with a pencil-thin mustache, approaches her and cajoles her into escorting a porcine rich man in a chauffeured limousine. As they cruise the through the night, she thinks back to her tragic youth and her abusive father. She had stabbed him to death with a switchblade after he shot and killed her unfaithful mother. The rich man takes her to bars and nightclubs and finally to his elegant high-rise apartment. He first ignores her as he feasts on an extensive meal. She tempts him, and when he advances on her, she stabs him with her switchblade, pushing the dying man out of an upper story window. As he topples, he grabs a pendant around her neck and it snaps as he plummets. The crazed woman races out of the building onto the street and confronts the body. The dead man’s hand still grasps her pendant in an iron grip! She saws it off with her knife and flees with it, as she imagines faceless passersby watching her impassively. Again, a patrol car appears. The same cop, with a strange frozen smile tracks her with a spotlight as she flees on and on. He seems to have her father’s face. She runs around a corner, hiding the severed hand in a blind flower girl’s basket. The pimp reappears and drags her into a club. An enthusiastic audience watches a jazz band playing. The smiling policeman enters, as the corpse of the rich man lies at the window pointing to his murderess with a bloody stump. Now everyone knows! The crowd surges forward, encircling her, laughing maniacally. She passes out, reawakening in her dingy hotel room alone. Were all of her encounters a nightmare? She goes to the mirror on the dresser, searching for clues. In her top drawer, she discovers her broken pendant, clutched in the fingers of a severed hand. The camera retreats and moves out into the streets, where a horrified shriek is heard – and the film fades to black. Dementia was shot in the studio in Hollywood and on location in Venice, California. Production, including editing, ended in 1953. The original film had no dialogue, only music and some sound effects, such as doors slamming, dubbed laughter etc. The film’s musical score is by avant-garde composer George Antheil, vocalized by Marni Nixon–there are no lyrics as such. 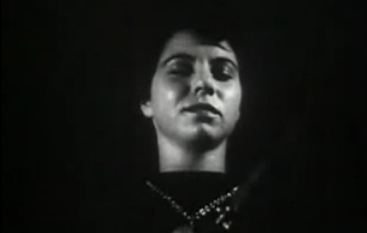 Jazz musician Shorty Rogers and his band, the Giants, can be seen and heard performing in a night club scene. Producer–writer–director John Parker is only credited as producer in the titles. In later years, actor and associate producer Bruno VeSota claimed to have co-written and co-directed the film with Parker.